Although pork is usually used to make cutlets in Japan, beef cutlets are also popular in parts of the Kinki Region such as Osaka. The Iwate Shorthorn has less fat so it makes for a healthy dish even when deep-fried. A light and refreshing sauce further brings out the flavor of the beef. 1) Cut the fiber of beef with the point of a knife to prevent shrinking when deep-fried, salt and pepper it, and coat it with flour, beaten egg and bread crumbs. 2) Peel the surface of the carrot, celery, pumpkin, cucumber and udo very thinly, and then cut the peeled skin in fine strips. Plunge all these ingredients in water. 3) Make sauce by mixing Worcester sauce with soy sauce, dashi and sudachi juice. Sprinkle in chopped Japanese welsh onion. 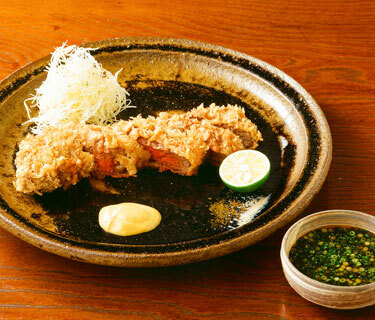 5) Cut the beef cutlet prepared in (4), place it on a dish and serve with vegetables and sauce prepared in (2) and (3). The Iwate Shorthorn is raised by way of a unique method called “Natsu Yama Fuyu Sato (mountains in summer and home in winter).” This is a method that capitalizes on the region’s unique natural setting and climate through the raising of the cattle in a barn during the winter season when the region is covered with deep snow and moving them to pasture in vast meadows upon the arrival of spring. It contains low fat content and a great deal of lean meat.